Try these Recipes for Irish Food Soon! Traditional recipes for Irish food have been passed down through the generations in Ireland and in countries where the Irish have relocated. A taste of home is preserved by sharing meals from the old country and remembering family and friends. The potato was the staple of the Irish diet when the tragedy of the potato famine struck the country. In 1845, the potato crop was wiped out by a blight and an estimated one million Irish died of disease and starvation. Many more were forced to emigrate to the United States, Canada, Australia and other countries to escape starvation. Ireland has, over many years, recovered and grown to the vibrant country you see today. Potatoes are still a staple, along with bread, meat, poultry, fish, dairy products, fruits and vegetables. Traditional recipes for Irish food are still prepared throughout the world and have been included in modern menu selections. Modern Irish recipes are delicious and satisfying. In recent years, Irish restaurants have become known for a new cuisine. The chefs of Ireland have developed a style that gives the traditional fare a European sophistication. 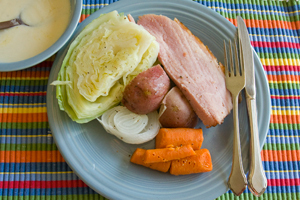 Recipes for Irish food are varied and delicious. You will find an amazing range of food choices when you visit Ireland. The cities offer the most variety. The availability of fresh sushi in a trendy upscale location in Dublin will be only a few blocks from the traditional fish and chips fare at one of the old favorite spots. Fine wines are served as well as the pint of Guinness. You will find whatever you are hungry and thirsty for. If you would like to order some authentic Irish food, you may want to try foodireland.com. I have ordered from this company and have been very impressed with the service and quality of the products. The cheeses are wonderful, and the crisps (potato chips) remind me of having a snack while driving around Ireland. The Irish style bacon gives you a bit of the "full Irish" breakfast. The Irish style scones are exactly like those I've had many times throughout Ireland. If you'd like to have a taste of Ireland, go to the Food Ireland website and make an order! You will even find special recipes for Irish wedding cake. Why wait for St. Patrick's Day? Try one of the authentic Irish recipes someday soon!